A University of Central Florida (UCF) chemistry professor has invented a revolutionary way to remove carbon dioxide (CO2) from air by triggering artificial photosynthesis in a synthetic material — breaking down carbon dioxide while also producing fuel for energy. UCF Assistant Professor Fernando Uribe-Romo and his students used a synthetic material called a metal–organic framework (MOF), which converts carbon dioxide into harmless organic materials — similar to how plants convert CO2 and sunlight into food. Scientists have been pursuing this goal for years, but the challenge is finding an economical way for visible light to trigger the chemical transformation. Ultraviolet rays have enough energy to enable the reaction in common materials, but UVs make up only about 4% of the light Earth receives from the Sun. For the lower-energy visible range, there are only a few materials that work, such as platinum, rhenium and iridium, but these are scarce and expensive. The solution was to combine cost-effective titanium with a highly porous metal–organic framework (MOF) material for light harvesting. (MOFs are used in the MIT-UC Berkeley system for condensing water out of air, also using only sunlight, as described recently on KurzweilAI.) The light-harvesting molecules, called N-alkyl-2-aminoterephthalates, can be designed to absorb specific colors of light when incorporated in the MOF — in this case, the color blue. 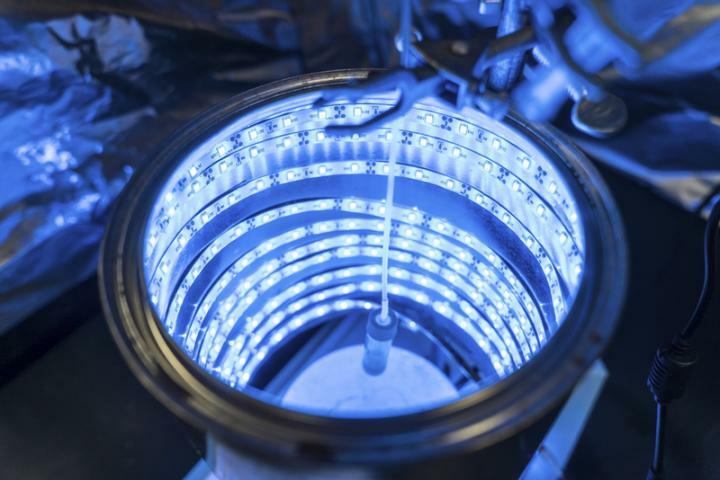 In an experiment, the research team assembled a blue LED photoreactor — a glowing blue cylinder that looks like a tanning bed, using strips of LED lights inside the chamber of the cylinder to mimic the sun’s blue wavelength — and fed in CO2. The CO2 was found to convert into two modified forms of carbon — formate and formamides (two kinds of solar fuel) — and in the process, cleaning the air. Uribe-Romo plans to continue to fine-tune the approach to create greater amounts of modified CO2 so it is more efficient and to see if other wavelengths of visible light may also trigger the reaction, with adjustments to the MOF material. If the process works efficiently, it could be a significant way to help treat greenhouse gases, while also creating a clean way to produce energy, says Uribe-Romo. He also speculates that someday, homeowners could purchase rooftop shingles made of the MOF material, which would clean the air in their neighborhood while producing energy that could be used to power their homes. The research findings are published in the Journal of Materials Chemistry A. Researchers at Florida State University also helped interpret the results of the experiments. A series of metal-organic frameworks isoreticular to MIL-125-NH2 were prepared, where the 2-amino-terephthalate organic links feature N-alkyl groups of increasing chain length (from methyl to heptyl) and varying connectivity (primary and secondary). The prepared materials display reduced optical bandgaps correlated to the inductive donor ability of the alkyl substituent as well as high photocatalytic activity towards the reduction of carbon dioxide under blue illumination operating over 120 h. Secondary N-alkyl substitution (isopropyl, cyclopentyl and cyclohexyl) exhibit larger apparent quantum yields than the primary N-alkyl analogs directly related to their longer lived excited-state lifetime. In particular, MIL-125-NHCyp (Cyp = cyclopentyl) exhibits a small bandgap (Eg = 2.30 eV), a long-lived excited-state (τ = 68.8 ns) and the larger apparent quantum yield (Φapp = 1.80%) compared to the parent MIL-125-NH2 (Eg = 2.56 eV, Φapp = 0.31%, τ = 12.8 ns), making it a promising candidate for the next generation of photocatalysts for solar fuel production based on earth-abundant elements.